This award recognises the importance of machinery and equipment to the current and future profitability of the livestock farming industry. Pyon Products were presented with the 2016 RABDF Livestock Machinery & Equipment Award, for their newly launched Store and Thaw Colostrum Management System that provides the tools to harvest, test, label, freeze and quickly thaw colostrum to enable it to be fed within the first few hours after birth. 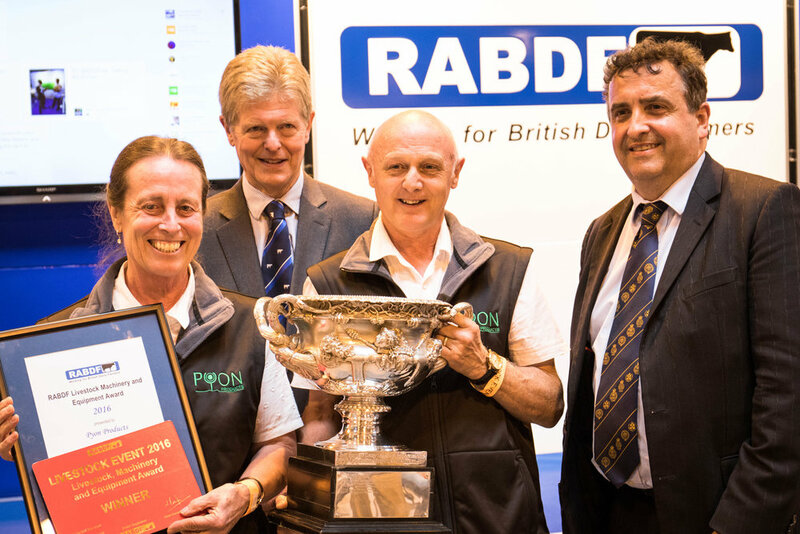 “The entry was a clear winner,” commented Lyndon Edwards, RABDF council member and chairman of the three-strong judging team. “We were impressed by the very practical, simple and value for money system which is British made – it ticks all the boxes. To see details of all previous winners, please click here. The RABDF Livestock Machinery and Equipment Award is presented for the item of machinery or equipment which is, or likely to be, of most economic importance to the livestock industry. The Award takes the form of a silver trophy which the winner keeps for one year, together with a framed certificate specially designed for the award, signed by the President of the Association and retained by the winning entrant. Entries considered by the judges to be of sufficient merit will each receive a Certificate of Merit and the winners of these certificates will compete for the RABDF Machinery & Equipment Award.